Don't throw out that coffee-soaked keyboard just yet. 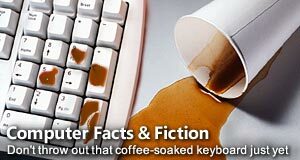 A desktop computer's keyboard will usually survive a coffee or beer spill. Turn the keyboard upside down on top of a kitchen towel and leave it alone for a while. Then you can wipe the top of the keys down with a slightly damp cloth and be back in business. You can try the same drill with a laptop's keyboard, but it may not fare as well because critical parts live beneath the keyboard and some liquid may ooze down. And beware, spills typically void a laptop's warranty, so some owners may find it worth the money to buy an extended warranty or accidental damage coverage that specifically covers drops and spills. Get it from the manufacturer who sold your equipment to you.